InformNapalm volunteer intelligence community has been conducting and publishing open source intelligence (OSINT) investigations since March 2014. For over three years, we are doing our best to give our readers the most complete information, showing the logic and data which provided the basis for our findings. We are always showing the original photos, videos, social media profiles and/or archives of this data. Crimea, Donbas, Syria – wherever we spot Russian soldiers and officers carrying out criminal, we disclose their full available data to the public. This is important in the realities of the modern hybrid war, where the aggressor is hiding behind the fog of post-truth. Even in those cases when the findings are based on closed data handed over to us by the hacktivists, InformNapalm provides open access to the mail dumps for additional analysis and re-verification to all interested parties. We consider this important in modern realities, this is our journalistic duty to the reader. Therefore, in this piece we should like to demonstrate on a specific example it makes no sense to hide information obtained from open sources. Classifying open data does not lead to the resolution of the conflict and to finding of the perpetrators, but only prolongs the prosecution process. Procrastinating and building smoke screens is not the best solution in the realities of the modern hybrid war. Ukraine is at the hot forefront of this confrontation. Every day, Ukrainian soldiers are mutilated and killed by Russian shells. Russian troops and mercenaries from the Russian Federation continue to terrorize civilians, occupying part of Ukraine: Crimea and pieces of Luhansk and Donetsk regions. Perhaps, being away from this war, it is easier to remain “balanced” above its battles. But, blurring the faces of the militants and cutting the names to initials, is not bringing the end of this war any closer. This is the way that saps the effort of the international community to resolve the conflict. The aggressor laughs at the results of impersonal materials, and only direct accusations and proofs make the Kremlin nervous, make it commit errors, offer lame excuses and lose face in the world. We do not want to take part in “saving face” to Putin, Shoigu, Russian officers, soldiers and officials. After all, being behind the “face-saving” veil, some continue to give and others to carry out criminal orders. They shoot down civilian flights, shell Donbas with heavy artillery and bomb civilian population in Syria, they build military bases in the border areas and plot new conflicts. InformNapalm wants no part in keeping their faces secret. On June 5, 2017, the Bellingcat team published this report: MH17 – Drivers of the Russian June and July 2014 Buk Convoy Trucks. This is a very substantial and important work, which, nevertheless, is covered with excessive fog. In this report, the investigative journalists resort to an interesting technique – “protecting the identities of the soldier-drivers”, information on whom that has been openly circulating on social networks for the last 3 years, since the crash of the MH17 flight. In their report, the investigators rely on data from the social media profile of a soldier of the 147th Automobile Battalion for Material Support (Ed: in the InformNapalm material referred to as “147th Automotive Logistic Support Battalion”) of the General Staff of the Russian Armed Forces (military unit 83466) “Dmitry Z”. 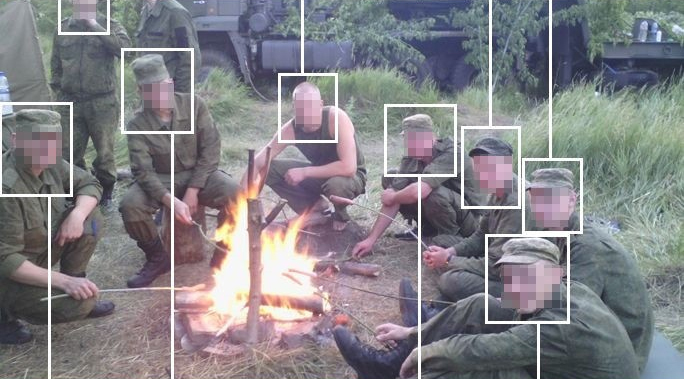 Anonymization of the data and the photo of the person involved is unnecessary, since his data and the entire list of photographs present in the report with open faces have already been published by InformNapalm on April 27, 2015. Behind the mysterious “Dmitry Z” is Dmitry Zubov. Read more about him and the transportation of the Buks along the Ukrainian border in the investigation: The Last Haul of the Russian Soldier to MH17. Attentive readers of the Bellingcat report probably noticed a link to the English translation of this material. The investigators point out that InformNapalm allegedly “found these photos a day later” (screenshot). Even the most professional analysts have their math confused. After all, it is impossible to release “a day later” an investigation published on April 27, 2015. At the same time, the report of the western investigators with individual photos from this publication came out only after 2 weeks – on May 13, 2015. Before publishing their investigation, InformNapalm volunteers made an online video recording documenting the details from the profile of Dmitry Zubov. 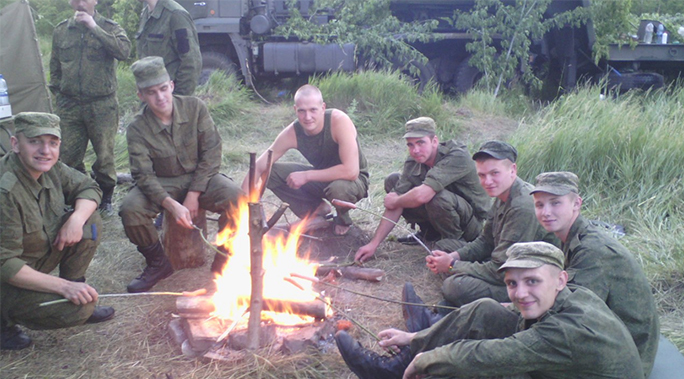 Each interested reader can not only view the screenshots, but also make sure that they were taken from the real VK profile of the Russian serviceman. The video was also published on April 27, 2015, and over the first few days it collected over 300,000 views. Therefore, “classifying” these materials by blurring parts of photographs is redundant.